Some of the players gave wheelchair football a go this morning when the Hawthorn team visited for a guernsey presentation. Hawthorn Football Club is one of five AFL teams to receive a Victorian Wheelchair Football League license. Governed by AFL Victoria, the Victorian Wheelchair Football League exists to provide an organised regular competition for the sport of AFL Wheelchair in Victoria, demonstrating what’s possible for people with a disability and that AFL can be everyone’s game. Hawthorn is a loyal advocate for organisations that bring awareness to mental health issues in Australia. Hawthorn’s vision is that every Australian has knowledge of the necessary tools to tackle anxiety and depression, so they can help themselves and others in the road to recovery. Living with a disability significantly increases the risk of developing Depression, particularly those that acquire the disability as an adult. AFL Wheelchair gives participants an opportunity to maintain their physical fitness, reducing anxiety and stress and more importantly a purpose, an opportunity to represent an AFL Club like everyone else. The game is played on a basketball court with 5 players on each team. Matches consist of four x 10 minute quarters. A handball is equivalent to a kick and a single handed underarm throw is equivalent to a handpass. There is no kicking in AFL Wheelchair. A player may stay in possession of the ball for a maximum of 3 pushes/changes of direction of the wheelchair, or cover 10 metres before bouncing the ball. Tackling is prohibited. The equivalent to a tackle is a touch with one hand. A player has two seconds or one push of the wheelchair to warrant prior opportunity, before holding the ball can be rewarded. 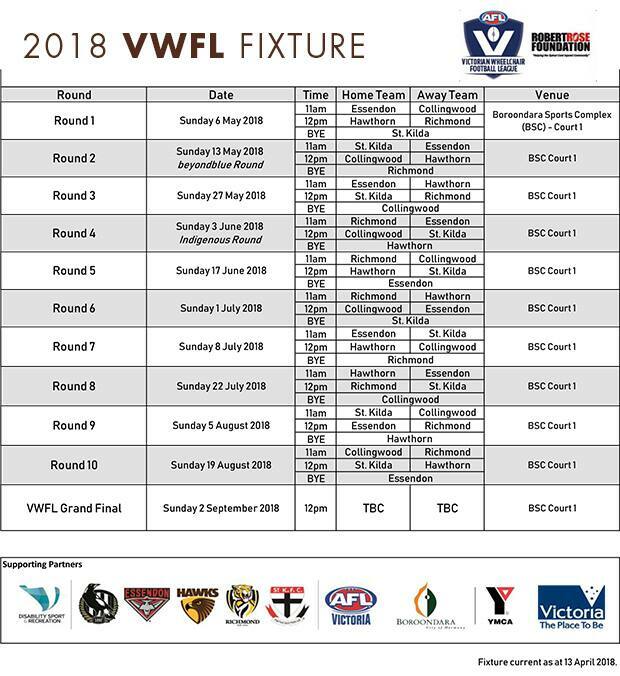 All games this year will be held at the Boroondara Sports Complex and run every Sunday from the 15th April to 2nd September.